Do you want to know more about Valencia city? I have three keywords for you: Beach, Bicycles and Fallas. Let me get into details for each one, and I’ll include some pictures for added effect. I know you like any large body of water, and its adjacent beaches – well, we’re situated on the coast of the Mediterranean Sea, and have a pretty huge beach to go along with it! Let me tell you, there’s more than enough room, even in high season (witnessed it myself)! Secondly, I’m bringing bicycles in the discussion for a very good reason – surely you remember when we were younger, and rode bikes every day during the summer vacation, right? Well, when I bought my bike here last year, I had a revelation (brace yourself, this might come as a shock). If we have a static job, and let’s say we spend one hour/day doing any kind of physical activity – running, biking, swimming, what have you – do you know how much of your daily time that amounts to? 4.16%. That’s right, you’d be spending less than 5% of your regular schedule keeping your body in shape. And this – assuming you actually have the time, means and place to dedicate 1h/day, which not all of us do. Well, buddy, Valencia does provide both the means, and the dedicated space for all your “rust-eliminating” needs, so to speak. We have the biggest park you’ve ever seen (well, if not the biggest, then the longest, for sure). 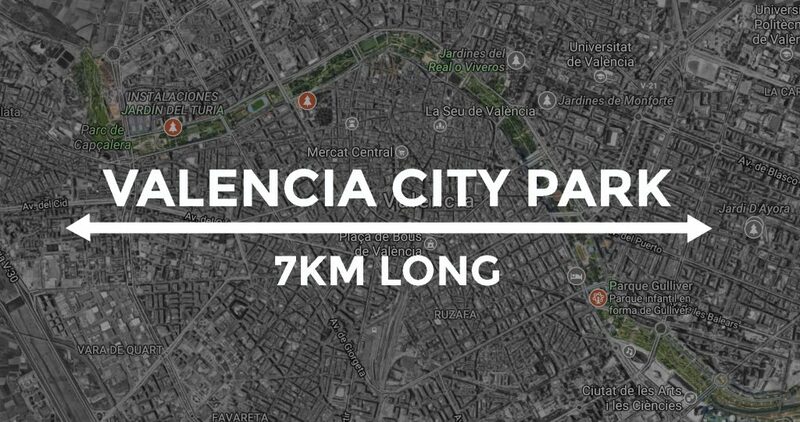 7 kilometres in length, with plenty of bike lanes to accommodate everyone risk-free. And you know what’s also awesome? We’re not confined to the city limits. Most of the outer, smaller towns are connected to Valencia by bike roads, alongside the actual highway. I couldn’t believe my eyes (not to mention there’s basically zero elevation)! See that futuristic-looking building in the distance? That’s the Opera House, and it’s part of the City of Arts and Sciences complex, fully inaugurated in 2005. Do you also want to work remotely?